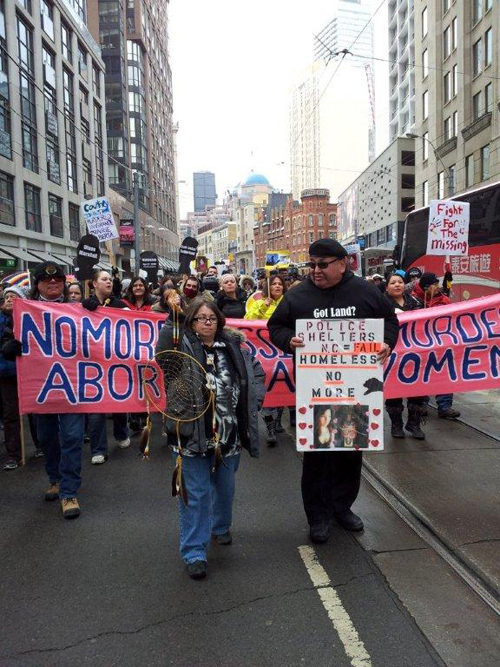 About 500 people attended the Feb. 14 Strawberry Ceremony held in Toronto to honour the more than 600 Aboriginal women who are missing or have died violent deaths, and to seek justice for the women with calls for a national inquiry. UN special rapporteur on the rights of indigenous people, James Anaya, who toured Canada last year, said the federal government should set up a national inquiry into the “disturbing phenomenon” of missing and murdered Aboriginal women. The Harper government has so far not heeded the call. It was the ninth year for the ceremony, which took place in front of Toronto Police Headquarters on College Street. 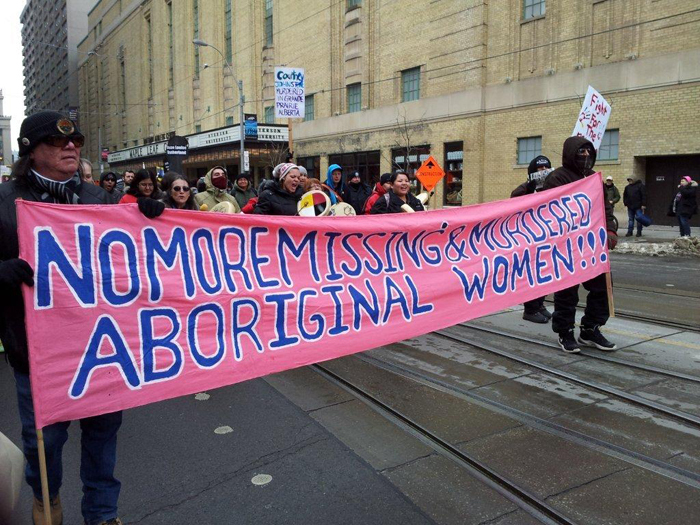 Signs with photographs and names of the women printed on them were a bleak reminder of the vulnerability of Aboriginal women. “We’re here in love, not anger,” said Elder Wanda Whitebird to those gathered, as strawberries and water, the women’s medicines, were given out. A coroner’s inquest ruled her daughter’s death an accident. Carpenter doesn’t accept this. The system, “…just wrote her off,” she said. If there had been a proper investigation, Carpenter said, they would have ruled the death a homicide. It was the violent and suspicious deaths of three young Aboriginal women in Toronto within the space of three months last year that prompted Carpenter to share her story. The ceremony gave special honour and recognition to the three Toronto women who died. Twenty-five year old Bella Laboucan-McLean plunged to her death from a 31st floor Toronto condo last July. A recent graduate of Humber College’s Fashion Arts program, she was going to study for a year in London, England before embarking on a career. Her family is confident she didn’t commit suicide. The police are investigating it as a suspicious death. Laboucan-McLean was a member of the Sturgeon Lake Cree First Nation in northern Alberta. Terra Gardner was just 26 years old when she was killed by a train in Toronto the night of May 14 in 2013. The police ruled there was no foul play in her death. Gardner, a member of Nigigoonsiminikaaning First Nation near Fort Frances, Ont. was homeless in Toronto, living on the streets and in shelters. She had reportedly talked to friends about receiving death threats because of her impending role as a witness in a murder trial. John Fox, the father of the late Cheyenne Fox, led the march from police headquarters, along Carlton Street to a feast at 519 Church Community Centre. More than 200 people stopped traffic as they marched and paused to drum and round dance at two major intersections. Fox carried a sign with a picture of his 20-year-old daughter, Cheyenne, that also contained his sentiments about how the system failed her. Fox describes Cheyenne as, “a very, kind, caring, loving person.” On the evening of April 24, 2013 she fell to her death from a 24th floor condo in Toronto’s Don Mills. Fox is not satisfied with the police conclusion that his daughter committed suicide. Audrey Huntley is co-founder of No More Silence which coordinates the event. She’s pleased that the numbers of people attending has grown from about 100 in the first year to over 500 this year. It’s a sign of growing awareness and concern. More than 60 Aboriginal and non-Aboriginal groups endorsed this year’s event, including colleges, universities, unions, religious groups and community agencies.